In a multi-way pot, @JonathanLittle flops top pair and a flush draw and bets, then gets check-raised. How to proceed w/top pair + flush draw after getting check-raised here? See what @JonathanLittle did. 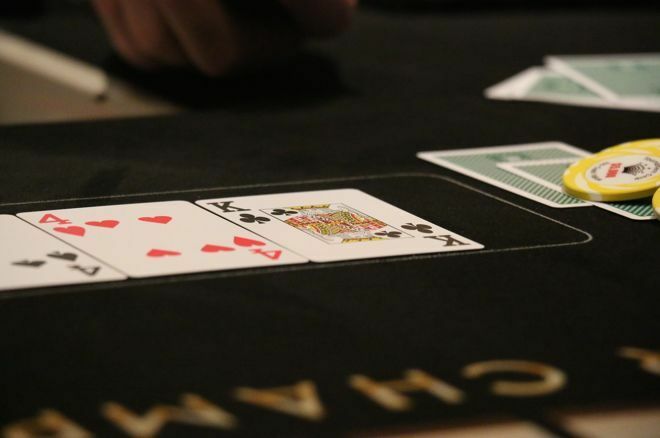 This week's hand comes from a $5,000 buy-in no-limit hold'em tournament and finds me raising from early position and getting a number of callers, then hitting a flop especially well in a spot where the board should also hit my opponents' ranges, too. Blinds were 300/600 with a 75 ante and from a stack of 50,000 I raised to 1,600 after being dealt from under the gun. The hijack and both blinds called, and the flop came . As noted, the hijack who called likely has either a pocket pair or high cards. The same goes for the small blind, meaning both players might well like this flop. The big blind has a wide range as well, and thus could be interested, too. The blinds checked to me, and as I discuss below I think my checking this flop is a viable option, despite having top pair plus a flush draw. These top pairs are nice to put into your checking range sometimes, especially when they are also strong drawing hands as in this situation. Betting is fine as well, though, and in this case I did bet 3,500 (about half the pot). The hijack folded, the small blind called, then the big blind raised to 12,000 (more than 40 percent of his stack). What might the big blind have? How should I proceed? Take a look below and listen to my analysis of the situation, see what I chose to do, and see how things played out. Turning the Nuts and Facing a Bet: Call or Raise?